My three young children are always looking for fun, creative toys to play and build with both indoors and outdoors. As a mom, I want to make sure that I am purchasing safe toys that are going to promote their creative expression and encourage them to use their imaginations. Therefore, I was very excited to discover the new Canoodle Toy brand which is proudly made in the U.S.A. 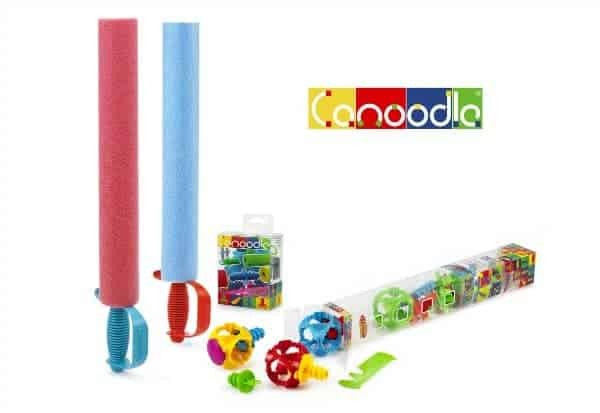 Designed for ages 5 and up, Canoodle Toy is an innovative toy line that was created so that children can use pool noodles to build structures, role play and ultimately have tons of fun. My six year old son and eight year old son worked together in cooperative play to build lots of unique structures using the differently sized shape connectors from the Canoodle Toy Mini Building Set. Snapping into place and connecting easily, this set features 19 pieces including connectors, twisters, sliders and attachments for lots of open-ended play. My daughter had fun playing independently to bend the noodles into different shapes while attaching the connectors. They all thought it was very exciting to make their very own unique toys and enjoyed spending time together to see what they could make. 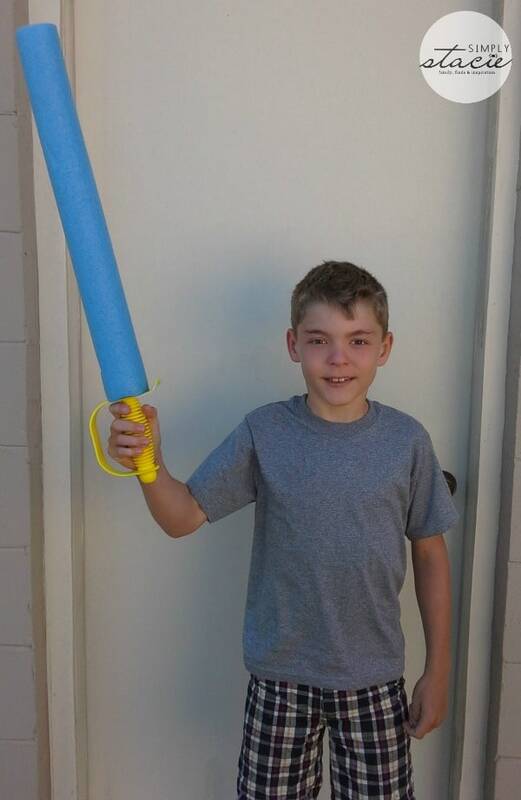 They really loved the vibrant colors and were even able to connect a “sword” handle to the noodle to make a soft pretend sword for a friendly “battle”. 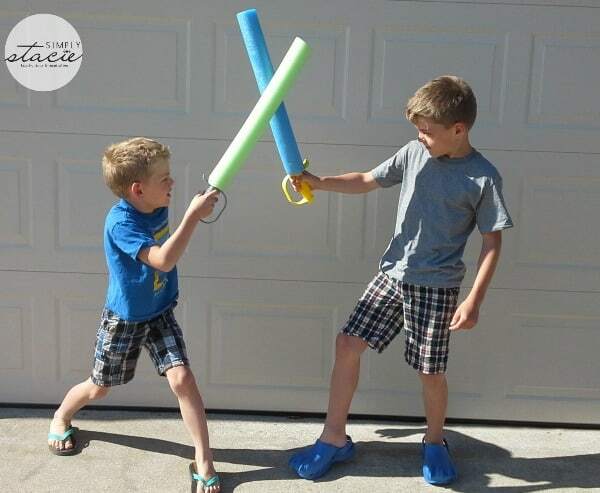 The Pirate Noodle Sword is tons of fun and kids can instantly transform themselves into a pirate, superhero, knight and more when playing with this fun toy. As a mom, my children’s safety is very important to me so I appreciate that Canoodle Toy has no choking hazards and is CPSIA compliant. The pieces are made of food grade polypropylene materials and the durable pieces are designed to last for many hours of play….in fact, there is even a lifetime warranty on all of the products in the line. 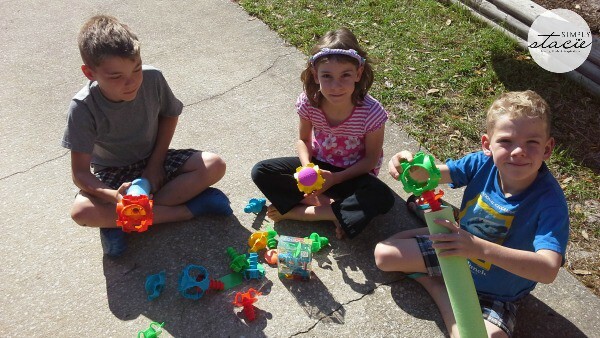 Canoodle Toy is the perfect way to encourage children to learn while playing and it is a great incentive to get them away from those electronic devices for good, old-fashioned playtime. This educational and developmental toy building set is sure to be a hit toy this season! Best of all, my kids are getting ready to get back into our swimming pool and they can’t wait to take their Canoodle Toy creations into the water with them. Since these products are made of a poly plastic resin the toys are buoyant to help avoid sinking….what a great idea! There are lots of great Canoodle Toy products currently available for purchase such as building sets, toy swords, accessories and more. You are invited to visit Canoodle Toy to learn more about this creative toy brand and get purchasing information. Canoodle Toy products are available at Bass Pro Shops, Amazon.com, Canadian Tire, Sears, Leslie’s Pool Supplies and Toys R Us! I like the Mini building set. I love the building ideas that they give you to use. They have videos to help you build all kinds of things. I love the Boater’s 4 Piece Building Set! I learned they have a Boater’s 4 Piece Building Set with two twisters and two sliders. The sliders connect the tow rings to the boat. I like the Canoodle swords because the kids always find branches, or rods and that ain’t good. I learned how to build a helicopter with canoodles. I also like the mini building set. I like all the different videos they have giving you ideas on things to creat! I love the Twin Sword Handle Set!!! Very fun idea! the Boater’s 4 piece Building Set. The mini building set stands out! I love the building ideas on their site. The palm tree one is cute. I learned they have a Building Ideas page giving many ideas on how to build different items. I am not always very creative so it helps to have something like this. My grandkids will think I am so smart! Boater’s 4 Piece Building Set! This is a fun toy…never thought about building with pool noodles.